Jerry and Linda’s jewelry is so lovely. Every day I wear a piece, whether earrings or a pendant, I get so many compliments. My husband bought me my first pendant and then I had to buy some earrings to go with it. From there I have added to the collection with 4 pendants and 6 pairs of earrings. 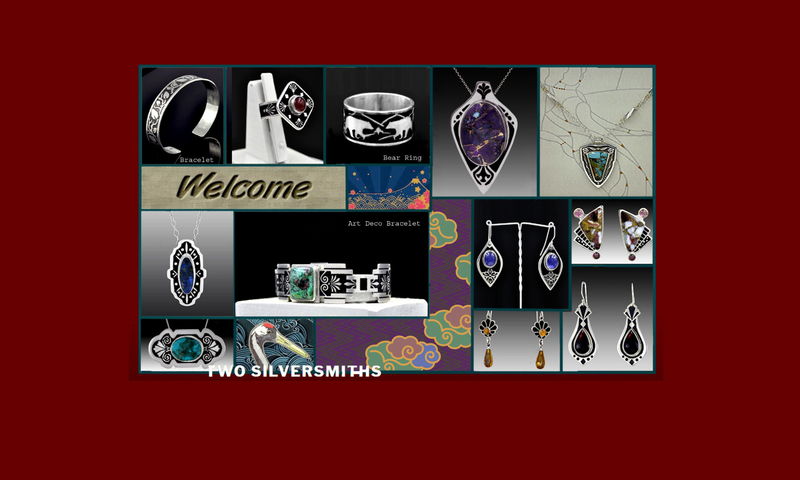 Anytime a special occasion comes up my husband knows I want a piece of Two Silversmiths jewelry. Their artistry and style and craftsmanship is so unique and beautiful. Sold for life. Thanks Linda and Jerry for making any outfit beautiful! They did a great job !!!! Both styles of the bear bracelet are really suberb!!! After two hectic years of creating new jewelry while reshaping our Two Silversmiths approach to our work and goals, we finally found time to bring our new website online, complete with a gallery from which you can view and purchase our work directly from us. We hope you enjoy your experiences here as much as we enjoy having this new opportunity to keep you up to date on new jewelry lines and pieces. We would appreciate any comments, suggestions or improvements that occur to you as you browse our gallery and make purchases. Among the changes we’ve made is reducing the number of galleries that represent us to Artists At Work in Brevard, NC, and The Jeweler’s Workbench in Waynesville, NC.